Beach Profiles of 42 Beaches (PDF, 13Mb) - This document contains beach profiles, and birds and mammals that you are to most likely encounter on 42 beaches between Bodega Head and Año Nuevo. 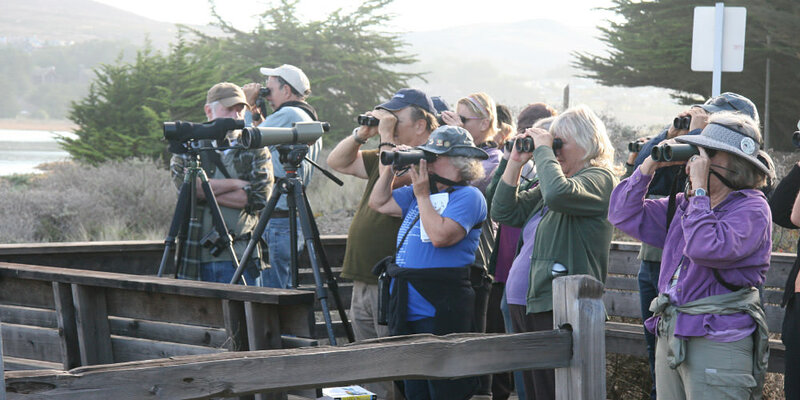 Beach Watch, acknowledged for its outstanding achievements, trains citizen-scientists to survey and document the resources of the sanctuaries. Developing a network of local stewards that document and exchange information on the biological and physical changes a particular beach may undergo throughout the various seasons and over several years. Since the fall of 1993, Beach Watch volunteers have conducted bi-monthly surveys. In 2015, in conjunction with the expansion of the sanctuary the Beach Watch project expanded, adding 14 new beaches and 30 new volunteers. Beach Watch now utilizes over 150 citizen-scientists to monitor beaches spanning 210 miles (339 km) of coast from Point Año Nuevo in San Mateo County north to Manchester Beach in Mendocino County. The Beach Watch program has an annual volunteer retention rate of 85%. In 2016, Beach Watch volunteers donated over 10,000 hours to the program for an equivalent value of more than $300,000. Beach Watch surveyors conduct oil spill sampling and tarball retrieval to assist the California Office of Spill Prevention and Response to detect and analyze the source of oil on coastal beaches. Surveyors from Beach Watch with special training have participated in multi-agency responses to oil spills in the San Francisco Bay and throughout the sanctuary. Several specimens of rare and endangered wildlife have been discovered and documented by Beach Watch volunteers, including a rare Cuvier's beaked whale, a species little known to the scientific community. The evidence gathered by Beach Watch volunteers helps the Federal government document the damage to wildlife and habitat from oil spills, determine clean up end points, identify birds and mammals at risk from oil pollution, and determine restoration projects. Data from Beach Watch were used to secure more than $52 million in restoration funds to increase protection of natural resources and enhance lost recreational uses along the central and northern California coasts. Beach Watch data also provides information on the erosion and deposition of beaches along our coast, by photo-documenting the shoreline. This time series of beach profiles is an important part of understanding the variability of the shoreline and impacts from climate change, storms events and sea level rise. View beach profiles and trends of the most likely species to be encountered at sanctuary beaches (PDF, 13Mb). Learn more about Beach Watch. The public now has access to over 23-years of biological data from 56 Northern California beaches through the Beach Watch online query system, hosted by Greater Farallones Association. The online query system allows public access to data on live birds and marine mammals and dead vertebrates. Users can choose different filters and groupings to view the data; for example, the data can be queried for specific species, by individual beach, or for a specified date range. The data are summarized and can also be displayed in graph form. The public now has access to nearly 22-years of biological data from 56 Northern California beaches through the Beach Watch online mapping tool, hosted by Point Blue Conservation Science. The online mapping tool connects data from the online data query system and displays the data in mapped format. Users can choose different filters and groupings to view the data; for example, the data can be queried for specific species, by individual beaches, or for a particular date range. The data are summarized by encounter rates (numbers of animals per linear kilometer surveyed).